Established in 2006, American Indians in Children's Literature (AICL) provides critical perspectives and analysis of indigenous peoples in children's and young adult books, the school curriculum, popular culture, and society. Scroll down for links to book reviews, Native media, and more. Are we "people of color"? I want Native children to have books that respect who they are, as Native children. I want Native writers to experience success in the publishing world, because that translates to opportunities for more Native writers. And I want Native writers to be successful in every genre--including science fiction and fantasy! But, there are things that don't belong in books. Let me explain. I was raised with a deep respect for our ceremonies and our religious ways of being. Wrapped up in that respect is a commitment to protect that knowledge. I can easily see and hear elders telling us, as children, “don’t tell your teacher or your friends ...” Their instructions are based on hundreds of years of experience with exploitation and misrepresentation that were--are--harmful to us as individuals, as people of a community, and as a tribal nation. Our elders, in essence, drew a curtain. A curtain between what can be disclosed, and what cannot be disclosed. It protects us. That instruction is a guiding principal that I bring to my study of children's and young adult literature. I lost sight of it, recently, and am addressing that failure with this blog post. And I am apologizing to friends and colleagues who are Navajo. Whenever I pick up a book, the first thing I do is look at the author. If the author is Native, I relax because I assume that the author is knowledgeable about their nation and that they will only disclose what can be disclosed. If the author is not Native or not of the nation the book is about, I look to see if there’s an indication that the book was looked at by someone with the expertise necessary to spot factual errors--and problems of disclosure, too. Back in February of 2018, I read and reviewed Legends of the Lost Causes by Brad McLelland and Louis Sylvester (they are not Native writers). I questioned their use of religious aspects of Osage and Abenaki people. So, I did not recommend the book. I noted that the book was blurbed by someone from the Osage Nation but that I had concerns and questions, nonetheless. Then in May, 2018, Elizabeth Bird at School Library Journal, published Sensitivity Readers, Cultural Considerations, and Legends of the Lost Causes. In it, she posed some of my questions to Jessilyn Hudgins of the Osage Nation's Cultural Center. Hudgins replied that McLelland was willing to change or take out anything that she wasn't comfortable with. Because Hudgins is of that nation, her feedback is important. It gives the authors and the publisher a green light to continue with the Osage content in the other books in that series. I started talking with Rebecca Roanhorse on Twitter about three years ago. In those conversations and on her website, I learned that she is Ohkay Owingeh (San Juan Pueblo) and Black, and married to a Navajo man. I also learned that she is a writer, working primarily in science fiction and fantasy. Somewhere along there I learned that she was working on a book with a Navajo protagonist. I learned the book was meant for the adult market, but because of the age of the protagonist, I wanted to see it. Tim Tingle's House of Purple Cedar wasn't marketed for teens. Neither was Louise Erdrich's The Round House or Marcie Rendon's Murder on the Red River. But--I'd hand those books to an older teen in an instant. So, I wanted to see Roanhorse's Trail of Lightning. I also learned that Navajo people were working with her on the Navajo content. Because of that, I assumed that she did not have anything in the book that should not be disclosed. When I got the book, I liked what I read and said so, on Facebook and on Twitter. When invited to do so, I wrote a review of it for Barnes and Noble's website. See how many mirrors the White child has? 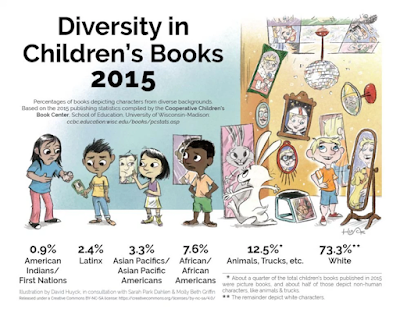 Over seventy percent of the books received at CCBC in 2015 featured White characters, and only .9% featured Native characters. 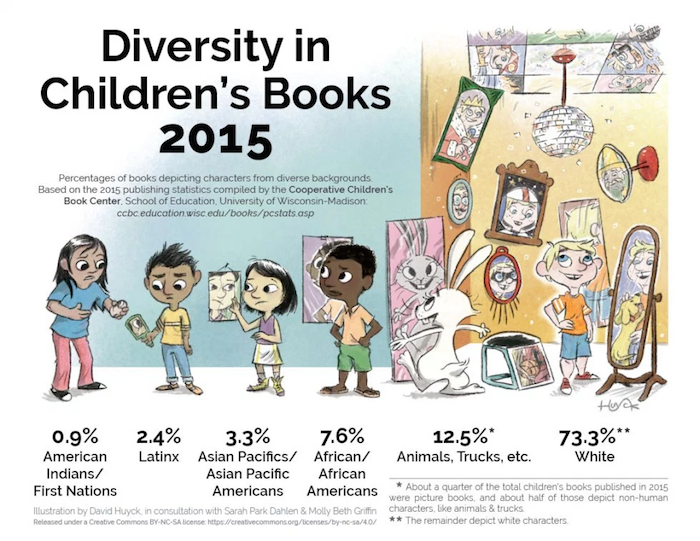 Even worse--the books included in that .9% are ones with stereotypes and otherwise bad representations! So--not only is the mirror the Native child holds small, it is one that distorts who Native people are. In recent writings, I've begun adding a curtain to Dr. Bishop's metaphor. It is similar to the line of disclosure. For some things, we draw a curtain on our windows. There are things we do not share and do not wish to share. (See, for example, an excerpt of an article I wrote for Language Arts in 2018). As I read Trail of Lightning, I recognized the places Roanhorse was writing about. The way she wrote about the setting struck me as a mirror. A splendid one, in fact. That's what I titled my article at Barnes and Noble: "A Splendid Mirror for Indigenous Readers." Roanhorse's book is published by Saga Press--an imprint of Simon & Schuster--which is significant. Simon & Schuster is one of the "Big Five" publishers in the United States. Most Native writers are published by smaller publishing houses. Getting published by one of the Big Five means way more visibility than is otherwise possible. So, I was happy on several counts. It looked like what I--as a Native woman and scholar--want to see! As evident on Twitter, there are Navajo readers who are taken with it, too. In some ways, the representations Roanhorse offers to readers of this genre are terrific. In most books set in the future, Indigenous people are completely missing. Roanhorse centers this story in Native spaces and features Native people. But, I started to hear directly from Navajo friends and colleagues. They are not at all happy with Trail of Lightning. From what I understand, Roanhorse crossed their lines of disclosure. If she had done this book using Pueblo religion, they said, she'd be called out for doing that. They're right. In fact, I'd be one of the people saying no to that book. And I'm grateful to them for, in essence, calling me out about my recommendation of Trail of Lightning. This situation is uncomfortable for them, for me, and I am sure it will be uncomfortable for Roanhorse, too, when she reads this post. From her interviews online, she said that she knows that there are things within Ohkay Owingeh that she would not share. This is a concept she understands. It'd be easier to just ignore this whole thing and keep disagreements amongst Native scholars, critics, and readers behind that curtain, too, but that kind of silence does not help writers, editors, and readers grow in their understanding of who Indigenous people are and how some of us feel about the ways our stories are used--even if the person using our ways is Native. There are many conversations taking place within Navajo circles. Some may write a letter (or letters) about Trail of Lightning. When those letters appear, I will add links to them. In the meantime, I invite you to submit comments or write to me directly with your thoughts or questions about what I've written above. A quick note on some of the conversations I've had, that I'll summarize here as a Q&A. If they don't make sense, let me know. Question 1: "What about other writers who have done this, like Tony Hillerman? Are people upset with him, too? And will they talk about his books?" My answer: Yes, I've talked with Navajo people before about Hillerman's books, and yes, they object to what he did, but I don't know if there are plans to talk about his books within the context of Trail of Lightning. Question 2: "Are some of these people jealous of Roanhorse's success?" My answer: That's possible, but the concerns are from a wide range of Navajo people, and I think that attributing the objections to jealousy rather than as serious concerns about the content is not fair. Question 3: "Are people being racist because she's Black?" My answer: That's possible, but attributing objections to racism is also asking us to ignore the serious concerns about the content. Question 4: "What about the Navajo people who are really liking the book? Are they wrong for liking it?" My answer: No, I don't think they're wrong for liking it. They may not know that traditionalists within the Navajo Nation do not think this content should be shared. They may change their minds later--or they may reject the idea of keeping some kinds of information private. Question 5: "What exactly is the problematic content?" My answer: I would not point out the specific problematic content if the book had violated Pueblo lines of disclosure, because doing that would do precisely what the author has done. I do not know how Navajo people will describe their concerns with it. When I see them, I will link to them. Links to sites (arranged by date) where Native writers and scholars discuss or write about this issue. Also includes links to videos or articles where the topic was discussed by Roanhorse. November 6, 2018. Trail of Lightning is an appropriation of Diné cultural beliefs, by the Saad Bee Hózhǫ́ (Diné Writers' Collective), published at Indian Country Today on Nov 4, 2018. November 15, 2018. Does the letter from the Diné Writers Collective Mark a Turning Point? by Debbie Reese at AICL. November 23, 2018. Guest column: New novel twists Diné teachings, spirituality by Jennifer Rose Denetdale, published in Navajo Times on November 22, 2018. I have read this book and found it a fascinating story with characters I loved, but I did wonder about the creation of a fantasy world in which a way of life/system of beliefs (I'm not sure what is the appropriate way to say what I mean) becomes the "fantasy" element of a story, whether that would have a tendency to relegate a true spirituality into the realm of "fantasy" for readers who already have trouble recognizing the existence of Indigenous peoples. It will be interesting to see how the dialogue occurs internally with Navajo. I think an important context for any objection is understanding just that - the Navajo Nation. Because Navajo is such a vast, widespread, and diverse community leading to a multitude of opinions, values, reactions, even "traditions" -- in the fine line of distinguishing an authoritative voice it becomes difficult. When reading this, I thought of your posts and the issues surrounding the Pueblo of Acoma and Dr. Peter Nabokov for his republication of sensitive Acoma cultural information. There, a singular, authoritative response was given. Acoma clearly stated that Peter Nabokov was wrong. And there, his transgression was the republication of an Acoma member's divulgence! Here, and maybe it has yet to develop - it seems a bit different. I for one may hold official judgement on Roanhorse's book. I don't think there is any reason to doubt that she worked with Navajo people on some of the content and in those circles it was acceptable. But therein lies the point - Navajo may have the problem of no singular, authoritative response to this issue. Question 6: "Are people being sexist because she's female?" Answer: That's possible, but attributing objections to sexism is also asking us to ignore the serious concerns about the content. I am trying to tease out a general principle from what you are saying here. Are you saying that confidentiality should be maintained whenever secrecy is clearly expected from any group participant, whether the group is religious/spiritual one (e.g. Navajo, Mormon, Masonic, Scientology), political (e.g. CIA, FBI, NSA), or social (e.g. fraternities/sororities including the many ethnic and racially based fraternities like APA and Theta Tau)? If not, what are your overall standards? Anon on Friday, August 10: Yes, there was a response from Acoma, to Nabokov's book. he made agreements with them that he subsequently violated. If there is one from the Navajo Nation, I will add it to the post. And yes--everyone will made a personal or professional decision to read and recommend TRAIL OF LIGHTNING. I do think Roanhorse is an excellent writer and as I noted in the post, there are Navajo readers who like her book very much. Anon on August 11: I'm thinking about a general principle, too. I have one, for my work, which is that I respect that which traditional peoples within a nation choose to withhold from the public. One thought is 'how do you know who to ask' (if you're a writer or editor). And given that we know Roanhorse did, in fact, have a reader or readers, I think it is very hard for us to come up with a general principle. Maybe the way forward is that writers be ready for the questions, and be ready to defend what they did. This is all specific to Native content. You pose questions about other groups. Have you seen Philip Deloria's PLAYING INDIAN? It has a lot in it about social groups playing Indian, in secret. I am glad Deloria brought visibility to that kind of privacy because I think it is not ok. I don't think it is possible to create a "overall standard" for every group and the privacy it asks for, by way of non-disclosures (frat and sororities often ask pledges to sign NDNs). Oops... that last bit in my previous comment ("I also think that it is") is a stray line that I failed to delete before publishing the comment. Agreed that NDAs whose violation would result in lawsuits are impractical. Disagree that there cannot be a single standard for writers that applies to all kinds of communications and practices in which there is a reasonable expectation of privacy, whether they take place in a Native nation gathering, a Theta Tau meeting, in a Masonic temple, a business meeting, or in a marital bed. The standard for writes would be that it is immoral to repeat those communications or practices in a book unless there is illegality involved (see: possible Trump-Russia collusion), or the communications or practices are such as would shock the conscience (see: Deloria) of a reasonable person. This standard would not be perfect, but it will take care of 98.6% of cases. I offer this anonymously because the idea, like all ideas, needs to stand on its own apart from my identity. I am the Anon from August 11th. I think that your attempt to establish a single standard, Anon, is part of a classical liberal attempt to define actions as immoral without considering the context of the action, and I think that is fundamentally misguided. Privacy concerning Native practices, beliefs, traditions, stories, and other aspects of life is a priority because of the way Native culture has been appropriated and abused by colonizers in the context of justifying historical and ongoing Native genocide by those colonizers. That's what makes that privacy important and its violation immoral. Nora Ephron's roman a clef regarding her marriage to Carl Bernstein just isn't the same thing at all, regardless of any "expectation of privacy" in a marriage. Nor is a business meeting. Nor is a fraternity meeting. There are real, material concerns in play here that cannot be reduced to "a reasonable expectation of privacy." @Devon Munn: Others have noted similarities in the two books, but this is not at all a case of plagiarism. I noted in the post that information has been exploited and misrepresented. Misrepresentations lead to misunderstandings and government policies that are destructive to Native communities. I have not heard from anyone with concerns regarding Bruchac's book. Anon/Veronica at 8:22 on Aug 15th: Thank you. Your response to Anon is well-stated. @Veronica, I appreciate your reasoned response, much as I disagree with it The argument I make is actually more deontological than liberal, but yes, it looks to create single clear standards that apply to everyone apart from their identities or belief systems, their cultures or perceptions. The alternative is constantly shifting moral standards in the eye of the beholder, and human history shows how problematic that approach can become. Your argument, in fact, is part of a classically Marxian attempt to define actions as moral depending on the power differential of the people involved. You, for example, would create different moral standards for writing re Native nations than for African-American fraternities in the USA. It is the argument that the Dialectical Materialists made in the 1930s and 1960s, and I actually applaud your honesty when you note that "there are real material concerns in play here that cannot be reduced to a reasonable expectation of privacy." Ironically, my response would be utilitarian. What has generally worked best for people to guide their conduct? I vote for single standards that take care of 98.6% of situations, including the Roanhorse book and its revelations, not flexible standards in the hands of the deciders. We've all seen where that leads, especially in places where the Marxians were and are in charge. I'd like to know what you see as the distinction between "Marxian" and "Marxist." As I was raised by Marxists, I use the latter when it seems relevant. You seem to be claiming that any nuanced understanding that takes history and contemporary power dynamics into account is Marxist; if that were the case, it would be the single best argument for Marxism that I can imagine. I am not a Marxist, so obviously I disagree with your assessment. You seem to believe that your desire to create "single clear standards that apply to everyone apart from their identities or belief systems, their cultures or perceptions" is logical and realistic, but nothing could be further than the truth. People do not exist apart from their identities and believe systems, their cultures or perceptions. Reality requires nuanced understanding, not rigid single standards that are unable to account for complexity. Further, holding everyone to one single clear standard has never happened in practice, suggesting that far from being a utilitarian idea, it is in fact an impossible idea. The particular standard you suggest is, in any case, far from clear. It is entirely subjective, and as such, depends on the creator's and implementors' identities, belief systems, cultures, and perceptions. Define "shocking." Define "reasonable person." Your suggestion is no more objective than my analysis. It is simply less nuanced and less willing to acknowledge the factors that it brings into play and its own assumptions. Similarly to the way you assume your terms are clear and objective, you return to this "98.6%" figure as though it holds any reality. It does not. You made it up. You have presented no evidence for it. Yet you make the claim that your idea holds utilitarian value. Surely any utilitarian would require genuine evidence of usefulness, not random numbers pulled out of the air. I do not see any evidence that pretending to have single clear standards have worked best for people in general (as holding everybody to one single clear standard has never happened, in practice). Places where capitalists (as opposed to Marxists) were and are in charge are nothing to write home about, particularly for black people, people of color, Native people, and so on. All Marxists are Marxians, but not all Marxians are Marxists. Marxians favor an analysis of politics, sociology, literature, and especially economics based on the theories of Marx and Engels. Those theories are atheistic and focus on power dynamics especially in class. If a person is of an "oppressed" class but does not adopt its dominant views (e.g. Ms. Candace Owens), that person is said to have "false consciousness" instead of a differing take. Marxism is the political program of the Marxians which calls for a dictatorship of the proletariat and common ownership of the means of production. Regarding Roanhorse, you are confusing clear standards and differences in their application. An unwarranted killing of a person is a murder. That's a clear standard. However, there are different degrees of it under the law, depending on context. Masha, I have not heard anyone use the phrase "false consciousness" in all seriousness ever, and, as I said, I was raised by actual Marxists. Literally not one of the many leftists I have known has ever said that anybody has "false consciousness." You are simply wrong. Nobody believes or says that. "Those theories are atheistic and focus on power dynamics" is vague nonsense. Marx and Engels do not own every concept of power dynamics, nor do they own all of atheism. Further, based on the theories of Marx and Engels, Candace Owens is not a member of an oppressed class, because they defined "class" very narrowly based on a person's relationship to the means of production. Their understanding of race was rudimentary at best. I am not confusing anything regarding Roanhorse. I am saying that no government has ever applied clear standards equally to all persons. I read this book and although I had some smaller issues with the writing style I loved the world and we as a book club wished the Navajo world was more flushed out. For myself, this was a beautiful insight into my daughters culture. They are both Cherokee but on their father's side. My oldest is 1/8 and her family name is "Byrd" ... We don't have much information about her heritage because her grandparents are dead and her father is not in her life. My question is why is it so secretive..I mean no offense in any way. I just would love for Children to have more storiesike this that gives them a glimpse into their culture in a fun way. My youngest is Cherokee and Chipawa and we do not know much more than that either other than she really wants to know her Native culture side and I was excited about letting her read this book. Any advice on how my daughters can learn more about their Native culture and religion without offending the Native nation? Thanks! Because fraud is a significant issue, make sure you're not on a fake site. American Indian? Or, Native American? There is no agreement among Native peoples. Both are used. It is best to be specific. Example: Instead of "Debbie Reese, a Native American," say "Debbie Reese, a Nambe Pueblo Indian woman." "Retired bishop apologizes for mistreating the Miwoks"
"What Student's Need to Know about America's Wars"
An oft-posed question: Who can tell your stories? "Proceed with Caution: Using Native American Folktales in the Classroom"
Teaching about American Indians: "You don't want us to do anything!" The phrase "Happy Hunting Ground"
"I am part Native Amercan"
More on "I am part Native American"
Posts about Stereotypical Symbols, Images, Mascots, etc. Representation, Stereotypes of American Indians, "Chief Illiniwek"
© American Indians in Children's Literature, 2006-2018. Unauthorized use and/or duplication of this material without express and written permission from this blog’s author and/or owner is strictly prohibited. Excerpts and links may be used, provided that full and clear credit is given to American Indians in Children's Literature with appropriate and specific direction to the original content. Starting a collection of books about American Indians? To start or add to your collection, visit the Best Books tab. "American Indians in Children's Literature"
"Fiction Posing as Truth: A Critical Review of Ann Rinaldiâ€™s My Heart is on the Ground: The diary of Nannie Little Rose, a Sioux Girl," by Reese et al. "More than just a blog: American Indians in Children's Literature"
Doris Seale's review essay of Elizabeth George Speare's "The Sign of the Beaver"
Review Essay of Anne Rinaldi's My Heart is on the Ground: The diary of Nannie Little Rose, a Sioux Girl, by Atleo et al. "The Voices of Power and the Power of Voices: Teaching with Native American Literature"
On LITTLE HOUSE: "Oh, mom, you would hate it..."